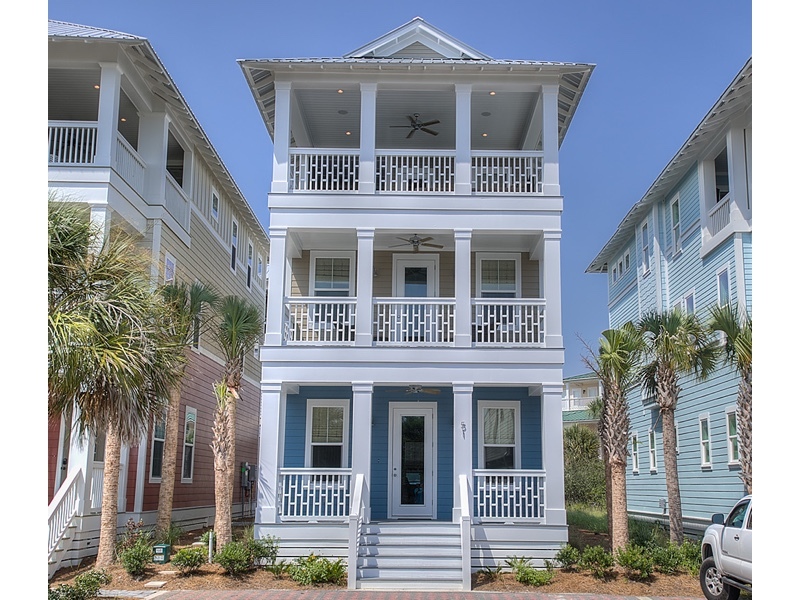 It’s a beach lover’s paradise at Marshall Cottage in Seacrest Beach! The owner/designer’s use of soothing blues, greens and creams (inspired by the natural beauty of the surrounding area) set the tone for an amazing beach getaway.Handcrafted Adirondack chairs greet guests as they enter through the front porch to the first floor living room fit for games, taking in a movie or lively conversation. Ease and entertainment continue in the kitchen at Marshall Cottage – expansive granite counters create the perfect space for even a novice chef. Continue just past the kitchen for a modern twist on the traditional farmhouse table.When it’s finally time to settle in for the night, you’ll be happy knowing plush king beds await just up the stairs on the second floor. The master suite looks out to the Gulf at the South with a deep garden tub, double vanity and reading area. Step out on the balcony to catch the breeze or enjoy your morning coffee.Across the hall, in the king guest room, guest are equally delighted with an en suite bath. At the top of Marshall Cottage, kids and adults will enjoy the third floor living room and outdoor summer kitchen. A cheery children’s room completes the package. Enjoy Gulf views from the 3rd floor, the 12,000 square foot Seacrest Beach lagoon pool with its fountains, waterfalls, lap pools and kiddie pools. Walk or beach to the neighboring restaurants and shops located in the village, Rosemary Beach or Alys Beach. If you are looking for a relaxing place to make memories with your family, Marshall Cottage is your destination.